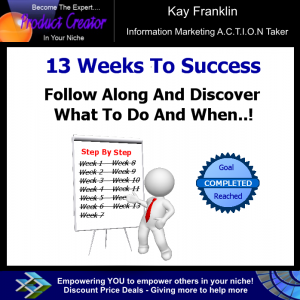 Build Your Own Information Marketing Business In Just 13 Weeks! Are you struggling to see how everything fits together? Perhaps you know what you should be doing but you don’t know what order you should be doing them in? Or maybe you are frustrated because at the start of each week you waste time wondering what the next step is? Would it help if you had a step by step plan to follow each week? You see in order to create a successful online business you have to work at it, each week you need to take action, each week you need to continue taking the steps you need to. But if you don’t know what those steps are or you don’t know what order you should be taking those steps then you won’t see the results you want. In fact you will end up feeling more and more frustrated and fed up. I know because that is what happened to me too! I knew lots of information about making money online. I even got started implementing some of it but I didn’t really understand how it all fit together. I didn’t understand why it was so important that I created my own products. I didn’t understand that I was wasting my time building a list before I had a foundation in place. I didn’t know that my email campaign was killing my own credibility! So I didn’t understand why I make zero sales! I had gaps that I was unaware of – I thought I was doing the right thing when I wasn’t! Well you can put an end to those feelings right now because I am going to let you have the exact same blueprint to follow that I have used and tested and know works. You see, once I started following these steps that you are going to have, I began to see things fall into place. Starting from scratch, I did things in a specific order – I was laying the foundation. I was building a real solid business and I started seeing results. Slowly but surely. You see if you don”t have a solid foundation to your business then you have nothing to fall back on. With the constant changes you see on the internet you really need to build a solid foundation to your business so that your business can stand firm with any changes that come along. Do you want a business that will stand the test of time or would you rather wait in the hope that you will get lucky every now and again? I know which I prefer! And if you don’t know the steps to take or the order you need to take them then you are like a headless chicken hoping you’ll be able to make it but constantly banging your head against a wall! Imagine if you knew exactly what you needed to do each week to build a solid foundation to your business. Each week you just followed my step by step instructions and by the end of 13 weeks you had a real online business with your own products and coaching program – an authority online presence and you had finally made it! In this first week you will understand the big picture – I’ll show you exactly how everything fits together so you know the bigger picture straight away and where you will be heading. I will teach you about getting into the correct mind set to make money online, and the concept of long term funnel revenue. This a vital if you are to be successful. This week you will determine the right things to include in your products so that people will BUY them – this is an often-missed step that people skip, then they don’t make money. I wonder why? 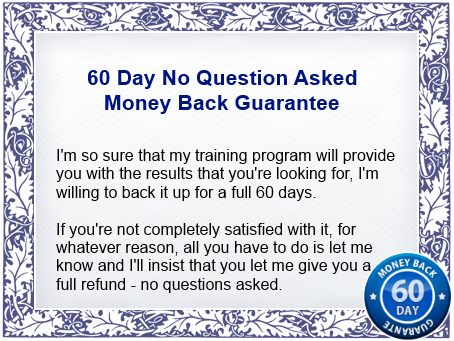 I am covering this upfront so that you will start getting results faster. It requires effort but it is definitely worth it. You will create your first product at the start of the 13 weeks using my method of really quick product creation and then you will realize just how easy it is! You will be able to create your own product within 3 days of studying this lesson. If you take action. Not many people teach about sales copy so I have included it here so that you know what you are aiming for. There’s no point in creating a product if you don’t know how to sell it in your sales letter. You will understand how to write one that will convert but is not all hyped up! Now you will begin building a relationship with your list and how you go about doing that. You’ll have your own email campaign set up quickly and know how to write emails that build trust and credibility. This lesson you will learn how an actual product launch sequence for your product. This is about how to write a product launch campaign. Again, this is not often included in training programs and is really vital to have in your email campaign so that you can launch your products on autopilot. This is a basic lesson. I have included it at this point because I want you to create your own product first and get your email campaign sorted! What’s the point in building a list if you have nothing to offer and no emails to send out? Now you can create a squeeze page for your product and start building up your subscriber list knowing that everything else is in place. This is the first part of traffic training that you will get. I have best results from using traffic from writing content and getting it published online. Its all about increasing your visibility over the internet. Getting your brand awareness out there. More training on getting traffic and building your list so you know exactly what you need to do and why you should use these high converting traffic sources! If traffic doesn’t convert into sales then it doesn’t matter how many people you have on your list – you won’t make money. It’s all about qualified traffic. All experts have a coaching program in place. If you don’t you are missing out on the big money. Coaching programs work really well in an information business. Therefore if you are serious about having a sustainable online business then this lesson is crucial and why I have included it. This is intense training on how to create your own coaching program really fast. You will have your own coaching program ready to go after this week. Here I teach you how to write a coaching sales letter. You will be able to write your own coaching sales letter that converts really well and develops the trust that you need in order to sign up clients. Another product you need to have to be just like the gurus is a long term continuity product or membership. This will enable you to create powerful long term revenue as well which is very important in providing a recurring income for you. You will be able to create your own really quickly with my method. The final week is perhaps the most important lesson in this entire course, because you will learn how to take your business that you have now created in the previous 12 weeks and scale it up to any level you want – full time income, multiple full time income, whatever you want. This is the beauty of this type of online business. You can easily scale things up and guarantee your income each month! How does that sound? Is this what you have been longing for? Perhaps you already work really hard and yet you still haven’t seen the results you deserve – well if you take action and follow my 13 week program, I can guarantee you will get results! Because you will be doing exactly what I did – and that’s when I finally got results I wanted! So what is the price of my 13 week success program? Every week for the next 13 weeks you will receive your step by step instructions by email and know exactly what you need to do – no more guessing! You will learn WHAT to do and HOW to do it. 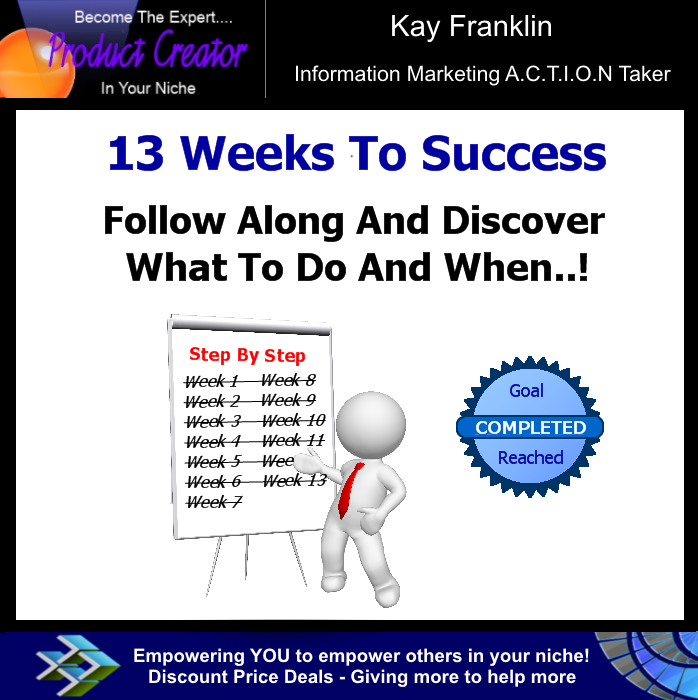 Start your own successful Information Marketing Business in just 13 weeks! You are able to cancel your subscription at any time and no further payments will be taken. Either you want these results for yourself or you don’t. If you are happy to carry on doing what you are doing and seeing nothing in return then I guess you don’t really want an online business with the freedom in brings – but you have a choice – finally get things working or carrying on wasting your time and efforts. Want to pay upfront or use a discount code? Click the button below.